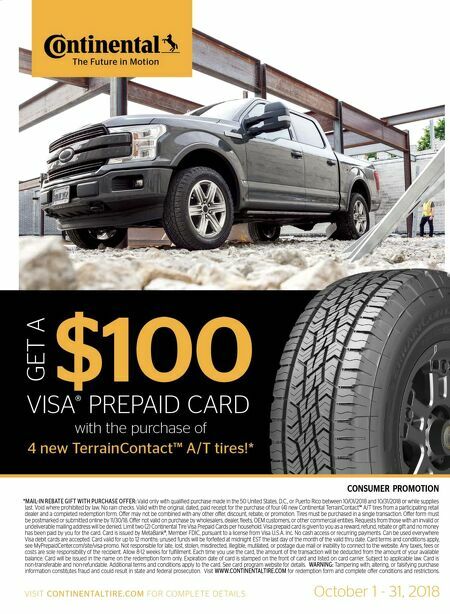 M T D O c t o b e r 2 0 1 8 62 E u r o p e a n N o t e b o o k I t is no secret that the tire industry on a global basis revolves around tire sales margins and profits, but this article is going to look at the other less glamorous end of the market — scrap tires — and in particular the latest trends and developments currently in place in Europe. Well over one billion tires reach their end of life around the world on an annual basis. It is a very negative fact that a great deal of these end-of-life tires are finally disposed of in landfill sites, which is a well-recorded threat to the environment. So it would be true to say that all European countries still have a problem handling their waste tires at the moment. And the true extent of how many tires end up in "hidden" landfill sites in each country, I believe is unknown. However, on the bright side of the situation, Europe as a whole appears to be taking the situation seriously. I have recently taken an in-depth look at the very latest new ways of effectively reclaiming scrap tires. My research revealed a number of innovative develop- ments for old, worn tires to avoid landfills, which will always be considered a negative action for the environment. For a start, companies are turning these tires into crumb rubber by grinding them at ambient temperatures (or cooling them with liquid nitrogen) to create fine particles. ese particles are currently used in many applications, including paving, playgrounds, a number of molded rubber products for garden landscaping plus artificial reefs for marine life, etc. It is generally considered by engineering experts that whole, shredded and ground tire rubber have significant advantages over other materials in providing the above products. ey are lightweight, porous and durable, and therefore provide excellent insulation, shock absorption and noise reduction. ere is also a growing interest in biofiltering rubber from old tires. is involves combining waste water with crumb rubber, which has a double impact as it reduces the problem of waste tires going to landfill while effectively treating waste water, storm water and even ship ballast water. Another progressive use for scrap tires is in electric arc furnaces. e old tires (being either shredded or used whole) are mixed with scrap metal in steelworks that use arc furnaces as it helps with the conversion of carbon monoxide to carbon dioxide. At the same time there is the practice of "devulcanization" which recovers rubber from tires using mechanical, thermal, bacterial and ultrasound processes to break down the rubber and re-use it in new forms. At the moment it is considered to be a very expensive procedure, but I am reliably informed that ongoing research is currently looking at ways to make it a more viable option for the future. Another alternative is pyrolysis, which like devulcanization is not really cost-effective at the moment but has to be considered as a way forward in due course. Even now, some (shall we say) less professional and conscientious tire dealers still prefer to use the quicker and, of course, less costly route of dumping their old rubber. For example, in the UK and some European countries there are regular reports of "mountains" of old tires being illegally dumped overnight in fields and even remote country lanes. is makes it extremely hard for the environmentally friendly approach of recycling used tires to become completely widespread. e respective tire industry associations throughout Europe are well aware of this mindless mentality. If caught dumping tires, offenders face financial penalties that can be very severe, and in some cases carry a prison sentence. With so much innovative potential available from old used tires, there is a lot of real incentive for Europe to somehow completely abolish tire dumping. Only time will tell if that is possible. ■ John Stone has been working within the global tire industry for the last 27 years. In 2004 he launched his own consulting company, Sapphire Media Service, which caters to business media clients around the globe. Stone also writes for tire and automotive-related publications in Europe, South Africa and Asia. 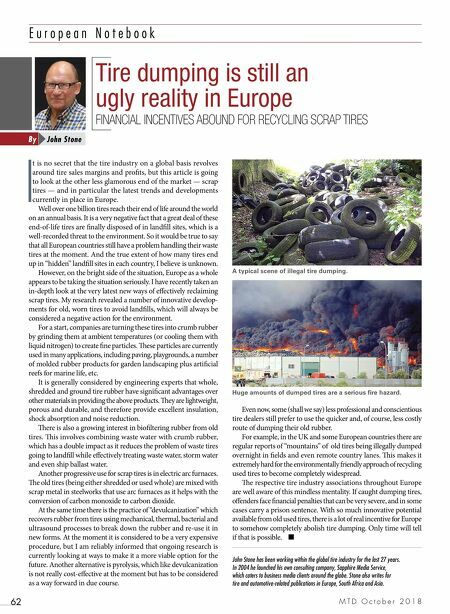 Tire dumping is still an ugly reality in Europe FINANCIAL INCENTIVES ABOUND FOR RECYCLING SCRAP TIRES John Stone By A typical scene of illegal tire dumping. Huge amounts of dumped tires are a serious fire hazard.